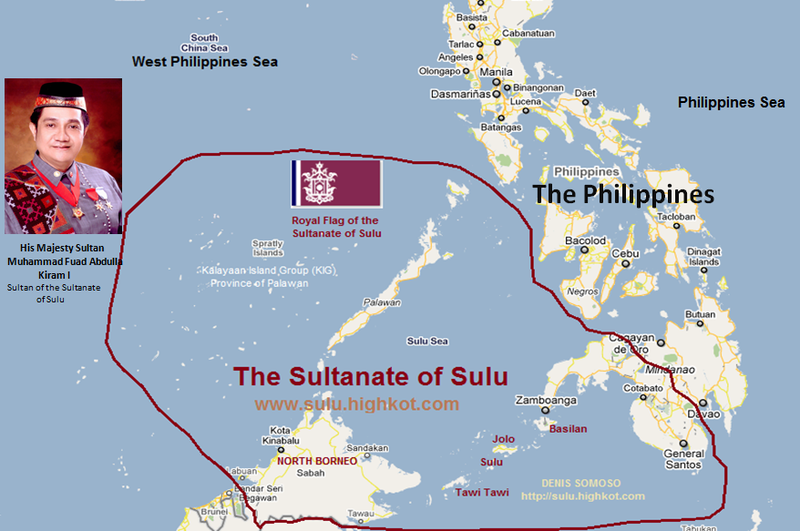 Home Philippines South China Sea Spratly Islands Sultan Muhammad Fuad Abdulla Kiram I Sultanate of Sulu West Philippines' Sea The Royal Sultanate of Sulu & the Republic of the Philippines will reunite as 1 and United Nations for the Spratlys. The Royal Sultanate of Sulu & the Republic of the Philippines will reunite as 1 and United Nations for the Spratlys. The Sultanate of Sulu slammed for the claim of China over the Spratly Islands, saying the disputed territory was part of the Sultanate of Sulu long before the Spaniards came to the Philippines. “China has no right over the Spratly Islands in what it calls the South China Sea because that is part of our ancestral domain, including the marine territory around it and the waters around these islands is part of the Sulu Sea,” Majaraj Julmuner Jannaral, Sultanate information officer, quoting His Majesty Muhammad Fuad Abdulla Kiram I, the reigning Sultan of Sulu and Sabah (North Borneo). Jannaral said China has launched a “divide-and-rule” strategy over ASEAN (Association of Southeast Asian Nations) members because it has refused to talk on the Spratlys issue, and instead wants to deal or negotiate with the 10 member countries individually. “This is unacceptable to me and my people,” Jannaral quoted the Sultan as saying. He said historically, the proprietary rights over the Spratlys, Sabah(North Borneo), the Sulu archipelago, and Palawan and parts of Mindanao belong to the Sultanate of Sulu and (North Borneo) Sabah even long before the Spaniards came to the Philippines. “Thus, China is violating our people’s human rights by openly and unilaterally announcing ownership of the Spratlys and the waters around it,” the Sultan said in an official statement. “But Sabah (North Borneo) is not an issue with China. Our concern here is the Spratlys and what China calls the South China Sea, because the Chinese leaders state this is their core interest,” the statement said. The Sultanate said that by claiming the Spratlys, China has manifested what President Aquino called “bullying” tactics on the five other claimants – Brunei, Vietnam, Malaysia, Vietnam and the Philippines. Jannaral said the Chinese military has even timed its announcement with the open sea trial runs of its first aircraft carrier in the north-eastern China Sea this month and its formal launch next October with its current verbal exchanges with the US regarding open use of the South China Sea by international commercial shipping. “My blood lineage dates back from the Mahjapahit and Shrivijaya empires, which extended from Sabah (North Borneo), the Sulu archipelago, Palawan, parts of Mindanao, the islands now known as the Spratlys, Palawan, and up to the Visayas and Manila,” the Sultan’s statement reads. “The Spanish colonial forces drove my forefathers from Manila and the Visayas but never conquered the territories of the Sultan of Sulu and Sabah because they failed to subjugate us. The Spaniards illegally transferred the Philippines, the Sulu archipelago, Sabah (North Borneo), and Guam to the Americans in their 1898 Treaty of Paris without the Sultan’s consent,” it added. According to the statement, the Sultan’s direct ancestor, Sultan Jamalul Ahlam Kiram, rented out Sabah to the British East India Company in 1878. Proof that Britain and Malaysia recognized the Sultan’s proprietary rights over Sabah is the yearly payment as rent, up to this day, which is paid regularly by Malaysia to the Sultan and eight other descendants of the first Sultan. The Sultan said he agreed with President Aquino’s position that China cannot legally claim ownership of the Spratlys, which are at least 800 miles away from the nearest Chinese territory, while some of the islands are within the 200-nautical mile economic zone limits of the Philippines under the United Nations Convention on the Law of the Sea (UNCLOS). He said China’s claim violates the UNCLOS, which it signed. The Philippines is also a signatory to UNCLOS. “President Aquino showed his quality nationalist leadership with his stand that settlement of the Spratly issue and the South China Sea - West Philippines Sea questions must be through peaceful and mutually beneficial diplomatic talks – especially to the members of the ASEAN since these islands are physically closer to us than China,” the Sultan said.